Three different Italian Regions are represented in this dish: Valle d’Aosta in the northeast, where Italian Fontina is produced; Emilia-Romagna, the breadbasket of Italy for Prosciutto di Parma and Sicily the home of Marsala and the wine named after the city, as well as France where Demi-Glace originated. 1. Have the butcher slice and trim the veal for scaloppine, telling him you need 12 cutlets. 2. Pat the veal dry on both sides and lay slices on a cutting board with narrow end facing away from you. 3. Sprinkle top with fresh ground black pepper to taste. 4. Layer on two slices of Prosciutto di Parma. 5. 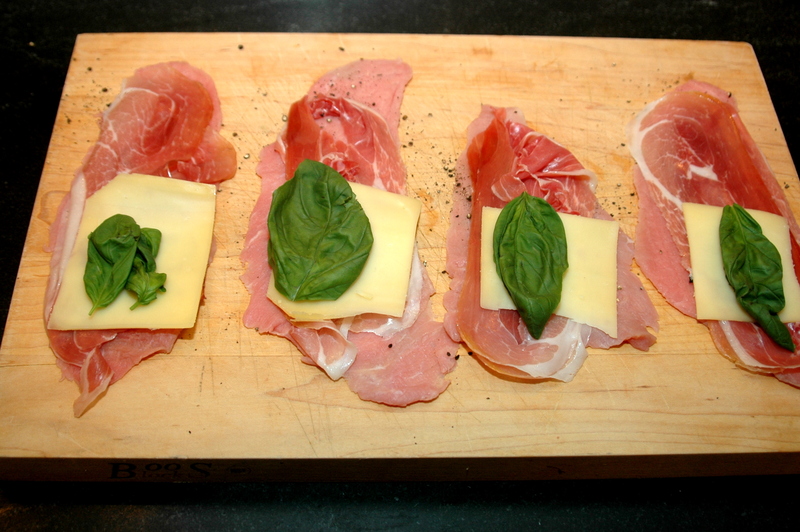 Cover prosciutto with sliced Fontina. 6. Place one basil leaf on top of the cheese, at the end closest to you. 7. 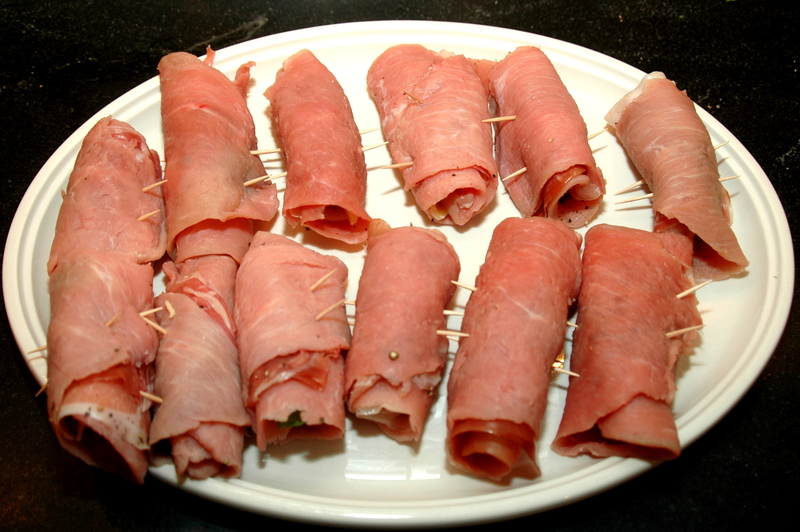 Carefully roll up the veal and other ingredients away from you so that the narrow end is on the outside of the rollup. 8. Secure each roll with two toothpicks. 9. Pre-heat oven to 200 degrees. 10. When all of the rolls are secured, dip them one by one, in the egg and then in the flour and set aside. 11. In a 14 inch non-stick skillet, on high heat, melt the butter. 12. When the butter is bubbling, add the floured veal rolls and brown for about 3 or 4 minutes turning every minute until all sides are lightly browned. 13. Lower heat to medium, add the 12 oz. 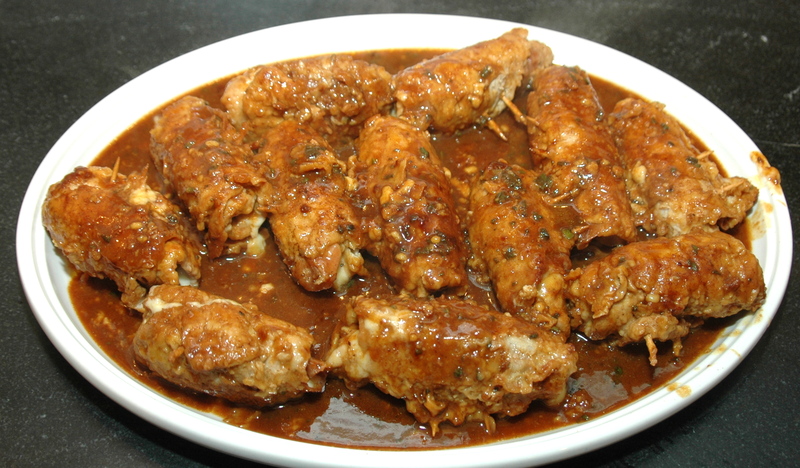 of Marsala, cover the pan and cook the veal rolls for 6 minutes, turning each roll after 3 minutes. 14. To make the sauce, remove Rollatini from the pan and keep warm in the oven. 15. Add remaining ¼ cup of Marsala, the sage and demi-glace to the pan, stir and reduce to desired thickness. 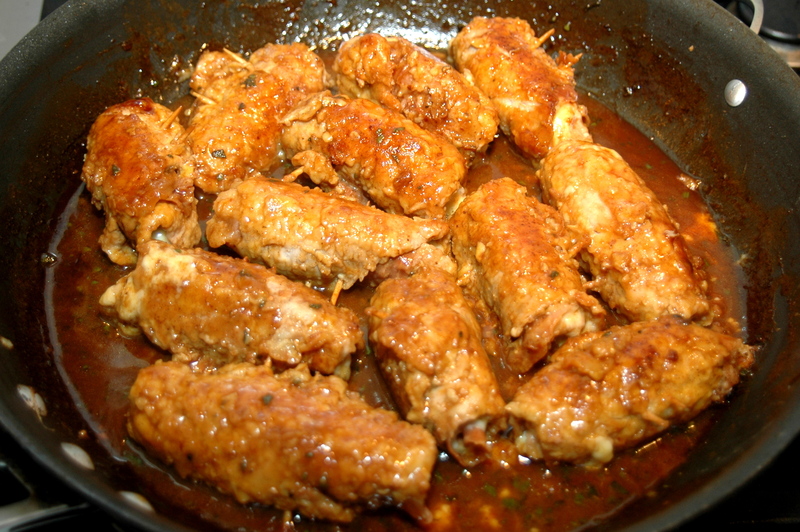 Return veal rolls to the pan along with any accumulated juices and turn once to coat well with the sauce. 16. Transfer the Rollatini to a serving platter, pour the sauce over them and serve immediately. Remind your guests about the toothpicks. Note: You can also use Sweet Marsala as well, however, I prefer the Dry type for this dish. This is a matter of taste preference and availability. When can you come onna my house and cook this for me? Seriously, it looks easy enough for an Irisher to do…which i will some day soon. Thanks. Grazie mille, chow is correcto! Made this for my friends. It was AWESOME! So delicious. They said it was the best Italian food they have had and better than some restaurants. Made it with the breaded asparragus. Great recipe! Ginnie, I am glad that you and your friends enjoyed it. Dorothea would be happy that you liked her asparagus as well. Of course she never wrote down anything she did, but Betty did a great job in preparing them from memory and developing the recipe. Prego! Nice blog. Going to try this tonight. Great. Hope you enjoy it. Please let us know.